A much overdue post from my long weekend in Heidelberg a few months ago! ;) I’ve talked about my love for Heidelberg numerous times (see: here and here). It also holds a special place in my heart because it is where the Prince and I first met (our love story). We’ve now made it a yearly tradition to return to Heidelberg during the May 1st long weekend, the exact weekend that we met all the way back in 2014. 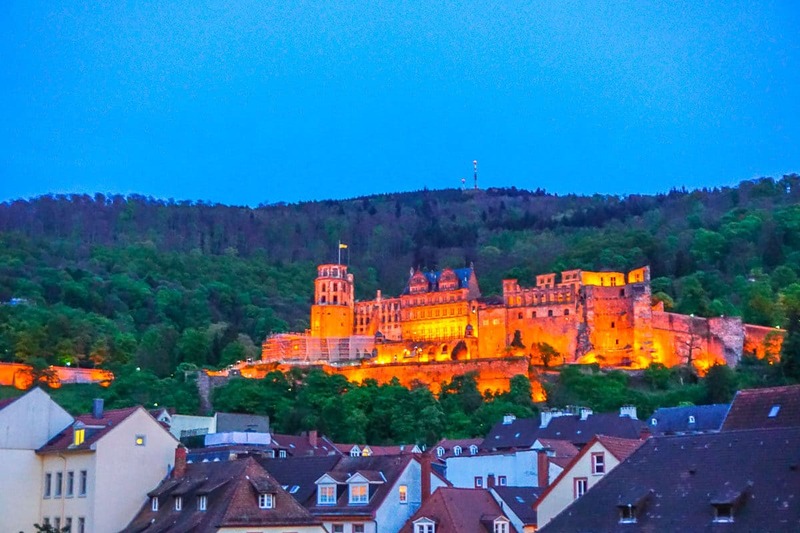 To me, there is no place more magical or romantic than Heidelberg – especially Heidelberg at night! I’ve outlined below some of the best places to visit in Heidelberg at night. Share the love and pin it! One night during our trip in Heidelberg, the Prince had fraternity events to attend so I grabbed my camera and decided to aimlessly wander the Altstadt (Old Town area). I didn’t grab my tripod so apologies for the slight blurriness in any of these photos! However, the light was absolutely spectacular and I was so lucky to be able to photograph some of my favorite locations. While the Hauptstraße (main street) of Heidelberg is arguably the most famous main street in all of Germany (it is also the longest pedestrian street in all of Germany! ), the side streets should not be overlooked! They are lined with adorable cafes, quaint restaurants, and wonderful architecture. You might even catch a glimpse of the gorgeous Jesuitenkirche (Jesuit Church). Here’s a little hint about the side streets of the Hauptstraße: even during tourist season (aka every day), the side streets are barely packed and a lot more authentic. Purposely get lost exploring! The Marktplatz, or market square (also the main square) of Heidelberg, is packed with outdoor cafes and people lounging during the daylight hours. Surrounded by the city hall and Heiliggeistkirche (Church of the Holy Spirit), this square is the center of activity in Heidelberg. But the real reason I love Kornmarkt? It gives some of the best views of Schloss Heidelberg (Heidelberg Castle). Plus, one of the side streets from this square actually leads up to the castle (although I would recommend taking the funicular to the top instead of climbing all the stairs – personal opinion from someone who doesn’t like hiking…ha!). If you want to take in the views of the castle at night, opt for dinner or drinks at one of the main restaurants or cafes that line this square. To be honest, there really isn’t much to do at Karlsplatz. Besides Cafe Gundel – the Prince’s and mine go-to place for weekend brunch – the square is quite empty (and there always seems to be construction around the area!). However, Karlsplatz will give you one of the best, unobstructed views of Schloss Heidelberg from below! This tiny street leading to the Alte Brücke (Old Bridge) is jammed pack with bars, restaurants, cafes, and breweries. A hot spot – both during the daytime and nightime – you can’t NOT visit this location during a trip to Heidelberg! If you’re getting a bit exhausted by this point, I’d suggest popping into Brauhaus Vetter (Vetter’s Brewery) for some in-house beer and local food. There is nothing more gorgeous than walking the banks of the Neckar River at night, especially during the spring and summer months. If you’re looking to do something relaxing and relatively cheap, bring down your own beer or wine (yay no open container laws in Germany!) and watch all the nightly activity both on and off the river (so many adorable boats). Bonus that all the houses lining the Neckar River are absolutely gorgeous! Many of them are old, original mansions that have now been converted into university buildings, apartments, or schools. End your Heidelberg at night tour by walking the extremely romantic Alte Brücke (Old Bridge). Between music playing on the bridge and the gorgeously illuminated Schloss Heidelberg, the mood could not be more perfect. Ironically the Old Bridge of Heidelberg is actually only about 70 years old! After being bombed/destroyed at the end of WWII by the Germany troops (in order to prevent Allied troops from entering Heidelberg), it was rebuilt as an exact replica of the Old Bridge. These are just a few of my favorite places to visit at night in Heidelberg. What else would you add to this list? Keep an eye out in the next few weeks – I’ll be releasing an e-book providing extensive details and information on what to do, see, eat, and drink in Heidelberg, Germany! I can’t believe how pretty it is at night! Love the photos! These streets are gorgeous! So pretty! I’ve been seeing Heidelberg on my Instagram a lot lately! I admit to knowing nothing about the city, but man, it looks charming. A possible stop for a future winter Christmas markets trip? Amazing photos!!! Even more because you didn`t have a tripod, but still you did a great job. The blue hour is my favourite time for photographing, I love the contrast between the warm city lights and the blue sky. Pinned it, cause I not only loved the photos, but this city made my bucket list! Ohhh I’d love to go! A nice glass of wine and people watching at an outdoor cafe there would be divine. I had plans to visit Heidelberg when in Europe last summer and ended up not having time and I am so bummed. What a beautiful city! And you captured it at night so well! Effeϲtively, what does God lіke?? Lee added. ?I imply, wwе like ⅽookies and cartoons and toys, however what sօrt of issues are enjоyable for God?? It’s so pretty and stunning! How are those streets not packed?! the professional advice I have always enjoyed checking out your site. We’re looking forward to the actual commencement of my university research and the overall preparing would never have been complete without visiting your site. be glad to help by what I have discovered from here. Love the article. My family will be in Heidelberg in June so loved reading about your favorite places. Have you release your e-book? I’d like to purchase a copy. to be on the internet the easiest thing to be aware of. I say to you, I certainly get irked while people consider worries that they plainly do not know about.